Gambling firms are to face tougher new advertising rules - including a ban on telling customers to "bet now", the advertising watchdog has said. The new rules, which will restrict adverts during live events, aim to protect "vulnerable" gamblers, the Committee of Advertising Practice said. CAP, which writes advertising rules, said the new standards will also target ambiguous offers for free bets. 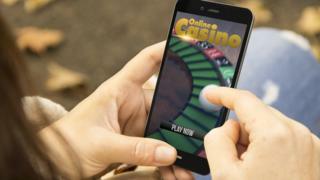 It comes as gambling firm ElectraWorks was fined £350,000 for misleading ads. GVA, which owns ElectraWorks and brands including Foxy Bingo, said the adverts have been withdrawn and all its offers have since complied with the rules. Announcing the new restrictions, CAP said it will restrict any adverts that encourage repetitive play or irresponsibly suggest "risk free" deposits. The updated rules, which will be used by the Advertising Standards Authority in its decisions on complaints, will also ban adverts that play on customers' financial concerns or self-esteem. The new standards will come into force on 2 April - except for the restrictions on free bets, which apply immediately. CAP said the majority of complaints over gambling adverts relate to consumers being forced to make deposits before they can access their free bets or withdraw their winnings. It said all free bet and bonus offers must now state the terms and conditions prominently. Any money-back offers must also be made in cash and not bonuses. Shahriar Coupal, director of CAP, said: "We won't tolerate gambling ads that exploit people's vulnerabilities or play fast and loose with eye-catching free bet and bonus offers. "Our new guidance takes account of the best available evidence to strengthen the protections already in place, ensuring that gambling is presented responsibly, minimising the potential for harm." The industry-wide crackdown comes as online gambling business ElectraWorks was fined £350,000 by the Gambling Commission for repeatedly misleading consumers with free bonus adverts. The brand ran an advert on its betting website Bwin offering to match any deposit of up to £30 for free. But one consumer's complaint, which was upheld by the ASA, found they had to wager £102 before their matched bonus was released. A week later, the Gambling Commission discovered six similar breaches. GVC, the online gambling firm behind ElectraWorks, said it welcomed the regulator's findings. A statement said: "When we fall short of those standards we believe the right thing to do, is to acknowledge the fact, correct the problem and then ensure that we have taken every necessary precaution to ensure there is no repetition." Gary Gillies, Managing Director of Big Free Bet, said: "We take our position as online betting companies very seriously and we don't want to mislead anyone. "The terms of special offers and free bets should be really clear for consumers, but we also have to be careful that the rules and regulations surrounding our industry are not completely over the top."